My jointer is the best upgrade I have made in my shop after purchasing the table saw. It allows me to buy 3S wood from the lumber yard. The added work I have to do makes the wood significantly cheaper. However, I also get to be much more flexible with how I use the wood. Besides saving money I can also work with ticker stock, which almost exclusively comes either in 3S or rough sawn form. 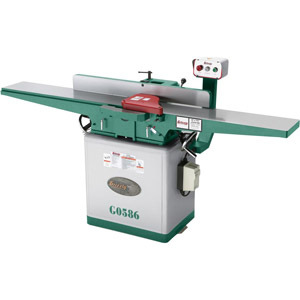 The jointer I decided to buy is the Grizzly G0586. Living so close to Billingham I was able to pickup the machine myself. The G0586 has three standout features: a long bed, 8 inch capacity, and it's price. This machine is a great buy in the hobbits price range. It is heavy, but not heavy enough to need a fork lift. It gets the job done, but it's not without its flaws. The table of the Grizzly is cast iron. The wings adjust up and down using hand wheels. The tables arrived dead flat from the factory. I measured them with a straight edge. I adjusted to the infeed table to be 1/16 inch lower than the outfeed table and have not touched the wheels since then. The fence of the Grizzly is long and high. It is easy to guide even wide boards on the G0586. The fence can be titled to allow for angled cuts. It is locked into place using set screws. A positive stop defines 90 degrees. This stop is of such low quality that I do not use it. I always measure anyways. Once the fence is locked down, it stays in place. The entire fence assembly moves in and out. This allows different areas of the blades to make the cut. Your blade will remain shaper longer. The feature is a great idea, but Grizzly implemented it very badly. A hand wheel turns a gear in the jointers body. A track in the fence assembly engages this gear. When the wheel is turned, the entire fence assembly is supposed to move. This feature has never worked on my machine. The gear is only half an inch in diameter. Mine never engages the track properly. I made it work by pushing the fence into the gear, but the fix turned out to be temporary. I want to just turn the wheel and not bother about the gear engaging the track. Dust collection is done through a single port, like on most jointers. It works very well for me. Operating the jointer without at least some for of dust collection is not recommended. Once the dust chute clogs, the jointer will start shooting saw dust all over the infeed table. The motor of the G1035 is more than capable. It cut through 6 inch wide oak without any problems. Jointing boards, which is the most common task in my shop, is no problem at all. The 3 blades on the jointer leave a beautiful cut. I decided not to buy the more expensive spiral cutter head. The blades leave a great finish which only needs 220 grit to call it done. All cuts come out square and flat. The jointer does exactly what it needs to do. The long infeed and outfeed table make it easy to support even long stock. I have fed 6ft boards through the machine without using extra supports. The ease with which I can perform this operation is what makes the Grizzly so great. It does what it is supposed to do without the operator thinking too much. Overall this machine performs superbly. It allows me to create my own board. Cuts are perfectly aligned, and the machine is easy to use. The fence assembly could be a bit better, but I hardly ever move it. If you are reading this and you are thinking about buying a jointer, you definitely should consider the Grizzly.